In January of 2011, Mumtaz Qadri killed the very person he was paid to protect. Qadri served in the squad of personal bodyguards for Salmaan Taseer, a liberal Pakistani politician and governor of Punjab province who advocated for liberalizing the country’s controversial blasphemy law. After killing the governor, Qadri surrendered himself to law enforcement and confessed to his crime, citing religious reasons to justify his action. Qadri considered governor Taseer’s soft stand on Asia Bibi, a Christian Pakistani accused of insulting Prophet Mohammad, as an effort to undermine the country’s contentious anti-blasphemy law. Bibi had been sentenced to death, but after continued pressure from the International Community, her death sentence was "temporarily suspended" in 2015. Being convicted of blasphemy in Pakistan carries the death penalty or life in prison, but so far because of pressure from rights groups and the international community, no one convicted has been executed. The slogan of remembrance at his funeral seems to have been followed through. Now Qadri is being hailed as a hero in Pakistan. Earlier this month, thousands of his supporters paid tribute to his grave-turned shrine on his death anniversary. Located on the outskirts of the capital city Islamabad, decorated by four white minarets to imitate Muhammad’s Mosque in Saudi Arabia, the shrine is attracting large number of devotees on a regular basis. Inside the shrine is the white marble grave of Qadri filled with fresh rose petals. The tombstone has inscriptions from the Quran. The ceiling is ornamented with detailed mirror-work and the walls are carved with names of God and Prophet Mohammad. For his followers, Qadri no less than a saint. 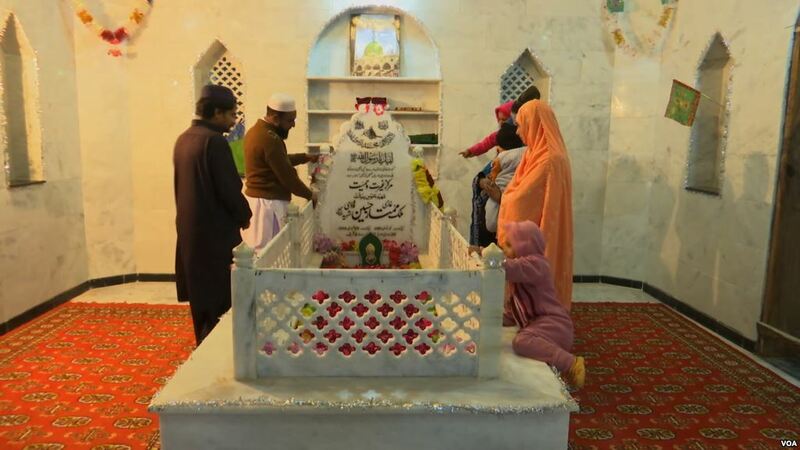 “I have come all the way from Multan [a city in southern Punjab] to pay my respect to Mumtaz Qadri,” I’m sure my prayers at his shrine will be answered by Allah,” Bilal Maqbool, a follower at the shrine told VOA with tears in his eyes. The shrine has initiated a debate on extremism in the country. Human Rights activists believe the shrine in essence glorifies and nurtures an extremist narrative in a country already undermined by terrorism and extremism. “Government of Pakistan has done nothing to stop this grave becoming a shrine. The gravesite should never have been allowed to become a shrine,” Zohra Yusaf, chairperson of Human Rights Commission of Pakistan told VOA. But to some in Pakistan, going to Qadri’s shrine is within the realm of freedom of expression and speech. Nasir apparently was referring to ‘Gulzar e Madina’ mosque in Maryland, outside of Washington, which recently celebrated the anniversary of the death of Mumtaz Qadri, and announced the event through a local newspaper. There is a table at the shrine where donations are collected for the shrine and its potential expansion into a religious school in the future. The house where Qadri used to live is in the vicinity of the shrine, and his family commutes to the shrine on a daily basis to manage it. Malik Muhammad Bashir, father of Mumtaz Qadri told VOA that donations collected from people would be used to build a mosque and to add a Madrassa [religious school] to the mausoleum, which is under construction. “God and his Prophet are supporting us. I agreed to collect donations only after talking to scholars and lawyers. I had no such intentions,” Malik Bashir said. “We are facing no issues from the government or anyone else. People come, pray and leave,” Bashir added. Blasphemy law in Pakistan remains highly controversial, and rights groups and advocates say most of the people facing blasphemy allegations are members of minorities who usually are the victims of personal grudges and disputes. Efforts to amend the law have been met with stern opposition in the past by those who support it. Opposition to the law is almost viewed as opposition to Islam. Sarwat Ejaz Qadri, president of the Sunni Tehreek, is an ardent supporter of the blasphemy law. “295 C is the only law in Pakistan which all religious scholars, all political parties have agreed upon and passed it through the country’s parliament. There’s no need to make reforms in blasphemy law at all,” Qadri told VOA. Some who dared to amend the law have faced severe consequences, including death — like Governor Taseer. Several faced that fate, a federal minister and several members of non-Muslim minorities have been killed in Pakistan for criticizing the anti-blasphemy law or seeking to amend it. In some cases just being accused of violating the anti-blasphemy law will draw the attention of those that believe in its strict implementation and that means serious threat to one’s life. Despite criticism, Pakistan’s government adamantly enforces the anti-blasphemy law. Prime Minister Nawaz Sharif recently ordered authorities to take measures against people posting anti-Islamic contents on social media. As part of the government’s crackdown, several bloggers have been arrested and the country’s Federal Interior Minister Nisar Ali Khan announced earlier this month that a Facebook delegation is to visit Pakistan soon to discuss the issue of blasphemous content on social media with Pakistani authorities. Pakistan has seen a surge in extremism over the last several decades. Rights activists are concerned that at a time when the country has vowed to destroy extremism, emphasizing on enforcing the anti-blasphemy law will only radicalize people, particularly the younger generation.